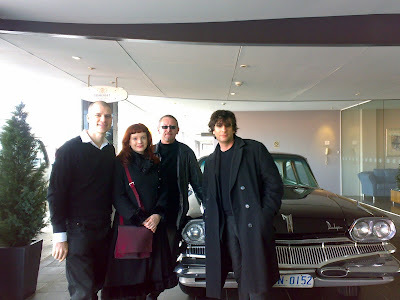 Sarah Tran, Allen and Unwin publicity goddess, and I got to Hobart yesterday morning and were picked up at the airport by friends Dianna and Mark and their friend Wayne, who was driving something a bit like the original batmobile. This was a car called Darlene. I didn't ask why she was called Darlene. 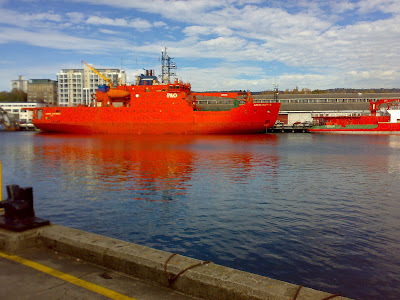 Beside the hotel, we saw this -- an icebreaker known as the Orange Roughy. This was the view from my hotel window. Here's Mark standing outside Ellison Hawker. 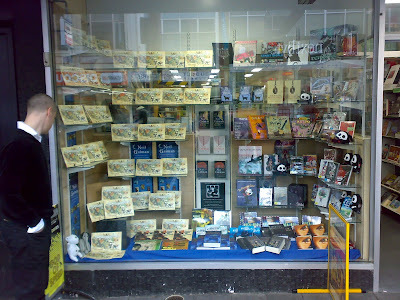 After the ABC radio interview I went inside and signed lots of stock for them. From there we went to eat, racing to be done in time for the event. We'd just finished eating when we got a call saying, "Everything's running late. Many people. Tickets. Argh. Don't come down yet." So we had dessert. Then I was introduced by Professor Jonathan Dawson (who I really wanted to chat to, but it was not to be) and I read a couple of new poems and a chapter from The Graveyard Book, one I'd never read aloud before, amswered some questions. It was fun. And then I signed. Lots of amazingly nice people, and at the end the people from Ellison Hawker presented me with a bottle of Tasmanian Single Malt as a thank you. 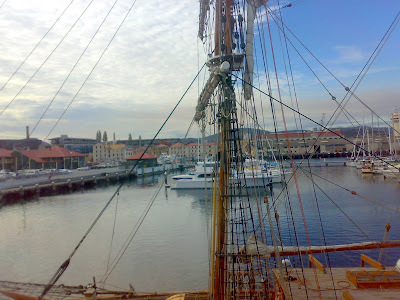 Then up betimes, and off to the airport, to Melbourne. Where it is raining and I have spent the day being interviewed. I want to close some tabs -- so here are some depressing playgrounds, here's me being given my Weird Tales 85 Storytellers Certificate, a YouTube Arkham Asylum fanfilm, and a terrific interview with Charles Brownstein of the CBLDF about the Gordon Lee case, which will, I think, answer a lot of questions for people. Also, Michael Moorcock, visionary, worldmaker, author, and editor, quite possibly also the man who inspired Alan Moore to grow a beard, was made Grand Master at the Nebulas. Here's John Picacio's speech -- containing interpolations by China Mieville, Jeff Vandermeer, Alan Moore and me myself, among others.